With the right amount of funds, a Crystal Serenity cruise makes sailing the world in luxury an attainable possibility. Whereas other cruises appeal to families with screaming toddlers and yuppies looking for adventure, Crystal Serenity is different. The luxury line is made for the distinguished, discerning traveler who will spare no expense for a lavish getaway. If you are in need of vacation and have the bank account to bolster it, look no further than Crystal Serenity. Read along to discover why this cruise is one of our favorites! If you've already pulled up the webpage to book your Crystal Serenity cruise, wait one second! There are a few points that travelers should consider when determining if this trip is the right fit. Destination, demographics, and also price are the major facets to review. The 1,080 passenger ship launched in 2003, making it the youngest of Crystal’s ships and also the largest in the luxury cruise segment. The modern, yet classic adornments of the vessel are illustrative of the 2011 and 2014 renovations made by the brand as part of a $52 million overhaul. Thereby, Crystal Serenity appeals to the sophisticated traveler. It is this, coupled with in-your-face grandeur and accessibility to uncommon amenities that make Crystal Serenity our top choice of luxury cruises. See for yourself! Crystal’s cruises are not in short supply of appealing options. That being said, right away, potential passengers will note the steep price tag for the trips. Trips begin around $1500, however they can quickly ring in at several thousand dollars. Those undeterred by initial sticker shock will be pleased to know that the fares are (nearly) all inclusive. This means that the total cost of the cruise incorporates gratuities for housekeeping and servers, and most notably the cost of wine/spirits. Anything you’ve ever wanted to see is probably along a Crystal cruise line. To tell the truth, the hardest part is choosing where to go first! We highly recommend reading reviews for each destination to learn the ins and outs of the itinerary and plan the best excursions. If you’re a young, late 20-something family with 2 kids under the age of 5 pining at the chance to board the Crystal Serenity — hold your horses! While this isn’t to say that Crystal Serenity is not family-friendly, the cruises do appeal to a specific demographic. By way of example, trekkers can expect to rub shoulders with a wealthier, retirement-age population. The formal, black tie elegance draws older, repeat passengers who have often cruised together before. Moreover, reviewers report that this lends to a “country club” vibe. Many of the empty-nest passengers utilize Crystal Serenity to celebrate milestone occasions (think retirements, anniversaries, and the likes). Travelers hail from all parts of the world and sport long, flowing gowns and tuxedos in the spirit of the cruise’s formal dress code. We like to call it "elegant resort casual." If you’ve made it to this point and think Crystal Serenity is the chic sightseeing tour for you, read on to learn about our favorite perks of this line. Most cruise lines give tourists the chance to see unexplored destinations whilst living aboard a massive, fun filled vessel. Yes, Crystal Serenity is much the same in this aspect. However, many qualities set this ship apart. Crystal Serenity is unmatched in its category. The luxury ship boasts a following of loyal customers who have traveled all around the world with the line. With features like these, it’s easy to see the appeal! Those who are unaccustomed to such blatant wealth may feel uneasy at first. Not to worry though, as a few evenings of luxury on Crystal Serenity will acclimate you to the finer things. Thus, if you’re already accustomed to the lifestyle of the rich and the famous, this cruise will just feel like an extension of home. For the wealthy, Crystal Serenity is home. This is due, in part, to two recent renovations to upgrade the fleet. To enumerate, the 2011 revamp brought new lighting, carpeting, furniture, and a redesign of the cabins. In a like manner, 2014’s refurbishment focused on adding living walls, outside sofas, a globally inspired dining deck, and full redesign of the 1,345 square foot penthouses. Available cabins include the Crystal Penthouse, Penthouse Suite, Penthouse, and Deluxe Storeroom, most of which have a verandah or large picture window. Marble top nightstands, plush bedding, and a stocked refrigerator are standard in each cabin. The southern California decor inspires a cultured, yet casual vibe. Of course, cabins are complete with bathrobes, kimonos, slippers, a safe, television/DVD player, telephone, 60 minutes per person per day of Wi-Fi, and a fruit basket. After a full day of activities, coming back to a swanky suite reminds you of simply one benefit to cruising on Crystal Serenity. The elegance extends far beyond the cabins though. Chic boutiques and retail dealers offer a myriad of products. However, the true demonstration of luxury is the incredible food. Whereas most cruise lines serve a mediocre meal in the main dining hall, Crystal Serenity is the opposite. Travelers report that the main dining hall, Crystal Dining Room, is just as good, if not better, than the specialty restaurants and eateries aboard. In addition, the globally-minded menu never (or very rarely) repeats. A testament to this is another cruiser’s assertions that on his 31 day cruise, the menu never repeated itself. A wide variety and attention to detail set Crystal’s lodging and sustenance accommodations a step above the rest. As a result, the price paid for the cruise is returned back to passengers tenfold in quality. Polished service specifically makes Crystal Serenity a hit for the lavish lifestyle. Side note: As of November 2018, Crystal Dining Room will be renamed Waterside. “Access to what?” you might ask. This is where Crystal Serenity truly shines. Access to everything! 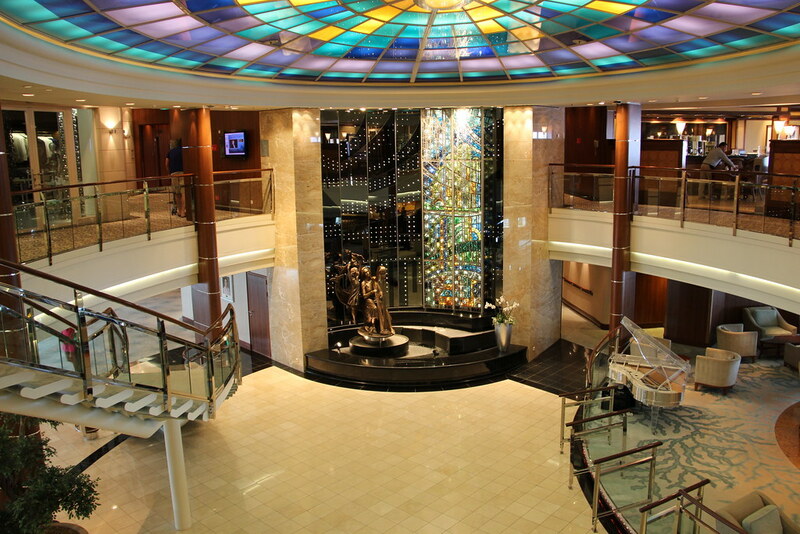 Of course, this ship has the usual pools, spas, and fitness centers. However, there is so much more to take advantage of when sailing on Crystal's line. Access to premier excursions also set Crystal Serenity apart. For all intents and purposes, Crystal does not include excursions in the fare. However, these are worth the extra cash. For example, a Crystal adventure once consisted of an overnight stay in Monaco during the Grand Prix. Starting at $1,000 a head, Crystal included VIP seating, catering, and access to an exclusive after-party. Other excursions include the Glacier Point Wilderness Safari, whale watching, dog sled racing, and the Misty Fjords. 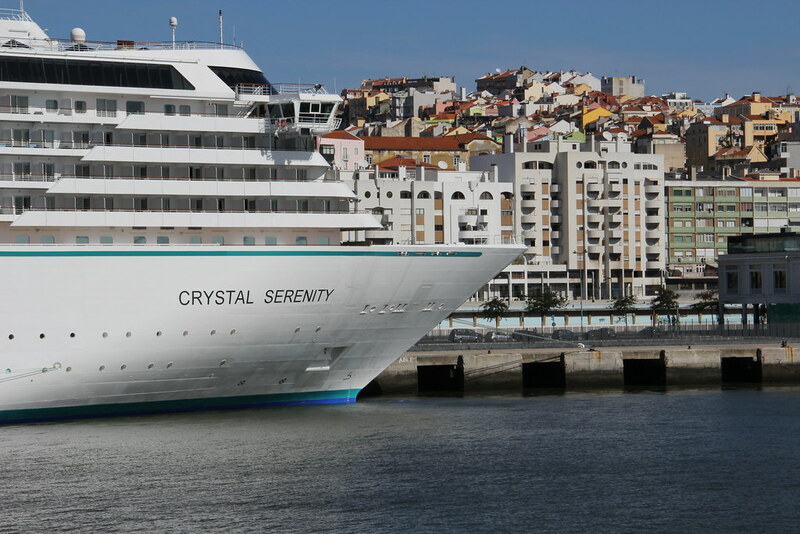 As you can see in the picture above, Crystal Serenity is pulling into Lisbon, Portugal. The ship's reputation allows access to the best variety of adventures with the best possible service. The Creative Learning Institute is definitely something to take advantage of during your voyage. This initiative gives passengers access to foreign language lessons, digital film-making (and other) courses, and professors of many disciplines. Included in the cruise fare and open to all passengers, the Creative Learning Institute is one major facet of Crystal Serenity that sets it apart from competitors. With so many destinations, the access to Creative Learning Institute allows travelers to immerse themselves in each culture and be mindful of their surroundings. Crystal Serenity reviews reflect an warm, positive experience. Nonetheless, travelers did have a few things to say as to the best and worst features of the cruise. Opportunity to see the best sites, even remote ones. High quality for what you pay. Access to the Creative Learning Institute. Spacious cabins with polished finishing touches. A high quality main dining room with diverse dishes. The ship's draw to repeat, retirement age travelers can have a country club atmosphere. The cruise isn't the expedition Crystal tries to make it. Despite their best efforts, it is difficult to combine luxury with backpacking. In addition, excursions are steep in price. If you don't plan on participating in many off shore excursions, you can still take it the natural sites by staying in a room with a balcony. Other travelers are friendly, but can be standoffish. Crystal Serenity is the perfect choice for experienced and wise passengers for whom money is no object. Although some customization is available in options for off-shore excursions, adrenaline junkies and true nature lovers will likely not feel as though this cruise meets their high energy needs. Additionally, families with small children find the activities less than age appropriate and stimulating in subject matter for youth. Rather, Crystal Serenity is a better cruise for seasoned travelers who want to opt for a fancier and more intellectually focused trip. Thus, the thoughtfully designed amenities ensure mature passengers are comfortable and well attended to as they see beautiful sites. If you've scoped out Crystal Serenity and have decided it isn't for you, there are indeed other options. For the wealthy traveler looking to spare no expense for a grand time, here are our favorite comparable cruise lines for a lavish experience. Seven Seas Explorer cruises boast the "Most Luxurious Ship Ever Built." Launched in 2016, this fleet contains impeccable service, fine dining, and total suite lodging. Although we aren't sure whether the Seven Seas Explorer is actually the most luxurious ship or not, it will certainly please the more refined passenger. Riviera is a premier luxury cruise line that offers a variation on the typical trip. This ship is able to port in locales that are normally difficult for larger ships to reach. Even still, Riviera's main claim to fame is its world-class cuisine. The only drawback to this alternative is that the fare is not all-inclusive. Nonetheless, those with the means will enjoy Riviera's Italian marble and overwhelming decadence. Viking Star found its way to water from its sister line, Viking River Cruises. The Viking Star is the line's first ocean-faring ship and is a wonderful alternative for anyone looking to be doted upon. That being said, it should be noted that this cruise is notorious for being not family-friendly. Despite its luxury status, Viking Star tends to fall short in amenities and entertainment. 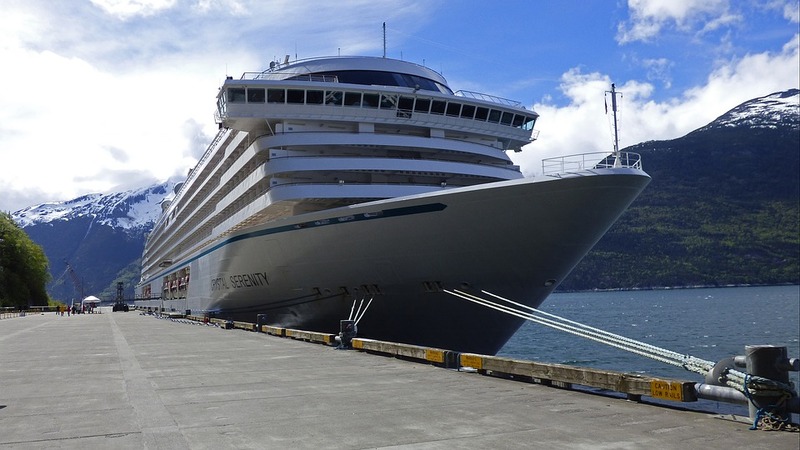 Ready to book a Crystal Serenity Cruise? If you aren’t wealthy yet, it may be best to save up for one of these cruises. In any event, when ready, be prepared to experience the best money can buy. Owing to a wide array of itineraries, its lavish lifestyle, and access to exclusive features, Crystal Serenity is perfect for your next milestone event. Tell us your thoughts on Crystal Serenity in the comments section below. Smooth sailing ahead! ​Related Article: Oceania Marina Review: Cruise Around the World in Luxury!